Cut the wings of the duck at the first joint and bone the duck as per the instructions (above). 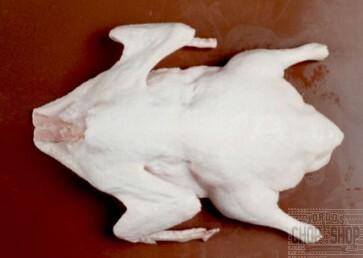 Lay the bird skin-side down on a cutting board. Slice off some of the thickest parts of the meat from the duck breast and thigh meat and cut into cubes. Place the cubes back onto the duck, season with salt and pepper and sprinkle with the cognac and port. Roll the duck up and place in fridge while preparing the pastry and stuffing. For the stuffing, cook the diced onion and garlic slowly in butter until they are tender and translucent. Transfer to large mixing bowl and add the port and cognac, minced pork, veal and pork fat. Add the eggs, salt, pepper, thyme, orange zest and chopped walnuts and mix well. To prepare the dough, place the flour and salt in a large mixing bowl. Add the chilled, cubed butter; rub the flour and butter together between the palms of your hands until it resembles fine sand. Add the eggs and mix with a wooden spoon. Add enough cold water so the dough easily holds it shape when formed into a ball. Turn the dough mixture out onto your work surface and knead several times until the dough forms a cohesive ball. Wrap with plastic wrap and place in fridge to chill for at least 15 minutes. Remove the duck from the fridge. Place the duck skin-side facing down on a work surface. Place enough stuffing inside the duck to cover the center part. Fold both sides inward toward the center and stitch up the opening using kitchen string and a trussing needle. Wrap and tie the string around the duck in 4 – 5 places to hold it together while cooking. Remove dough from fridge. Roll out ⅔ of the dough into an oval shape on a floured surface. Place the trussed duck on top of the dough, with the breast side facing up. Bring the edges of the dough up around the duck and pat into place. Roll out the remaining dough into an oval shape and place on top of the bottom crust. Pinch or press the edges of the top and bottom crusts together. Brush the top crust with an egg wash. Roll out the remaining pastry dough and cut out small round or oval shapes using a cookie cutter. Use the back of a knife to press fan-shaped lines into them. Decorate the top crust with these shapes. Brush the entire top crust and pastry decorations with egg wash. Place a foil funnel or piping nozzle in the center of the pastry to let out steam during baking. Bake for 1.5 to 2 hours at 180 C or 360 F. Remove from oven and let cool. Lift the top crust gently off and lift out the duck. Cut off the trussings, place the duck back inside the pastry and replace the top crust. Serve either cold or warm. Boned Duck Baked in Pastry Serves: 6 Ingredients 1 duck salt/pepper 2 tbsp. cognac 2 tbsp. port For the stuffing ½ cup mined onion 2 cloves chopped garlic 2 Tbsp butter ½ cup port or cognac 1½ cups each minced pork and veal 1 cup minced pork fat 2 lightly beaten eggs salt and pepper to taste ½ tsp thyme t tbsp orange zest ½ cup chopped walnuts For the pastry dough 5 cups all-purpose flour 2½ cups chilled butter, cubed 1 tbsp. salt 2 eggs about ½ cup cold water Instructions Cut the wings of the duck at the first joint and bone the duck as per the instructions (above). Lay the bird skin-side down on a cutting board. Slice off some of the thickest parts of the meat from the duck breast and thigh meat and cut into cubes. Place the cubes back onto the duck, season with salt and pepper and sprinkle with the cognac and port. Roll the duck up and place in fridge while preparing the pastry and stuffing. For the stuffing, cook the diced onion and garlic slowly in butter until they are tender and translucent. Transfer to large mixing bowl and add the port and cognac, minced pork, veal and pork fat. Add the eggs, salt, pepper, thyme, orange zest and chopped walnuts and mix well. To prepare the dough, place the flour and salt in a large mixing bowl. Add the chilled, cubed butter; rub the flour and butter together between the palms of your hands until it resembles fine sand. Add the eggs and mix with a wooden spoon. Add enough cold water so the dough easily holds it shape when formed into a ball. Turn the dough mixture out onto your work surface and knead several times until the dough forms a cohesive ball. Wrap with plastic wrap and place in fridge to chill for at least 15 minutes. Remove the duck from the fridge. Place the duck skin-side facing down on a work surface. Place enough stuffing inside the duck to cover the center part. Fold both sides inward toward the center and stitch up the opening using kitchen string and a trussing needle. Wrap and tie the string around the duck in 4 – 5 places to hold it together while cooking. Remove dough from fridge. Roll out ⅔ of the dough into an oval shape on a floured surface. Place the trussed duck on top of the dough, with the breast side facing up. Bring the edges of the dough up around the duck and pat into place. Roll out the remaining dough into an oval shape and place on top of the bottom crust. Pinch or press the edges of the top and bottom crusts together. Brush the top crust with an egg wash. Roll out the remaining pastry dough and cut out small round or oval shapes using a cookie cutter. Use the back of a knife to press fan-shaped lines into them. Decorate the top crust with these shapes. Brush the entire top crust and pastry decorations with egg wash. Place a foil funnel or piping nozzle in the center of the pastry to let out steam during baking. Bake for 1.5 to 2 hours at 180 C or 360 F. Remove from oven and let cool. Lift the top crust gently off and lift out the duck. Cut off the trussings, place the duck back inside the pastry and replace the top crust. Serve either cold or warm.